Would it be great if all wines were 100-point blockbusters? I don’t think so, even if we could afford them. Powerful, complex wines demand attention. Their star power overwhelms everything else in sight. They make us work hard to understand them even when we just want to relax. There is much to be said for a wine that does its job even though that job is modest—like making dinner go down easy. This Bowtie Barbera is such a wine–ordinary wine that makes the ordinary seem good enough. It won’t stop conversations, steal the show from an Osso Bucco, or make you think thoughts of divinities. It’s job is to support supper, take the edge of the evening—this it does well. The good people of Piedmont have their Barolo’s and Barbaresco’s when they want to impress. 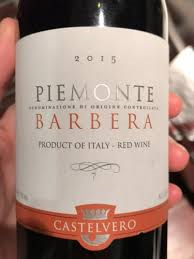 They make Barbera for when leaving an impression is too much trouble. Simple black cherry fruit, hints of earth after aeration, mouthwatering acidity, soft tannins—it is exactly what it is supposed to be and no more. A very standard Barbera d’Asti at a good price. Family Winemakers, the trade association for small wine producers in California, held their annual tasting in San Diego on Sunday—200 wineries, over 1000 wines, and about 2 hours to taste before the crowds get overwhelming. No. I didn’t taste them all. At big wine events like this I tend to ignore most of the common varietals and seek out wineries that are doing something innovative, making wines that are unusual or not typical for California. This event highlights the innovation and risk-taking going on in California among small producers. Some of these wineries are little more than a garage, proving that you don’t need a multi-million dollar estate to make great wine—just skill, good taste, guts, and enough coin to get your operation off the ground. Here are my standouts from Sunday’s event. Tablas Creek 2010 Cote de Tablas Blanc A blend dominated by aromatic Viognier with Grenache Blanc, Rousanne and Marsenne to provide structure. White Rhone blends are no longer so unusual in California, and Tablas Creek is an established producer, but this one was so good I couldn’t resist including it. Field Recordings 2010 Chenin Blanc Intense aroma and creamy, fleshy mouthfeel. The best I have had outside of Vouvray. Most chenin blanc grown in California is sold as bulk wine. This one is extraordinary. Clavo Cellers 2009 Vermentino An Italian grape especially well known in Sardinia but seldom grown in the U.S. This wine shows tropical fruit and an exceptionally rich, creamy mouthfeel. Urban Legend Cellars 2009 Amador Barbera One of the most underappreciated trends in the wine world is the extraordinary Barberas coming out of the Sierra Foothills. This one is rich and spicy,a nose full of cloves and a wonderfully elegant mouthfeel. Urban Legend Cellars 2009 Teroldego They did it again for me. This is a small winery located in downtown Oakland with a great eye for small lots of local grapes with which to create their magic. Teroldego is a Northern Italian grape probably genetically related to Syrah. It is dark, dark, dark, figs and lots of spice. A bit like Zinfandel but with a blacker heart and more acidity. Harrington Cellars 2008 Nebbiolo This may have been my favorite wine of the event. Beautiful violets and some earth on the nose and a spicy but elegant mouthfeel, almost soft until the tannins remind you this is a Nebbiolo. This grape is seldom successfully grown outside Piemonte, Italy. Harrington’s is an excellent expression of this grape and proof that it can be grown here. An intriguing blend of 60% sangiovese from the hillsides of East Paso Robles and 40% barbera from the cooler seaside, this hedonistic wine shows berries and vanilla on the nose with wisps of herbs and earth to add complexity. Round and charming on the palate with sparkling acidity and a silky finish, it reminds me of the friend you call when you need cheering up–not too complex or serious but guaranteed to make you smile. Fans of the 2008 might find the 09 to have less residual sugar and a bit more grip due to the cooler weather. Sells for about $28.00. Limited production.